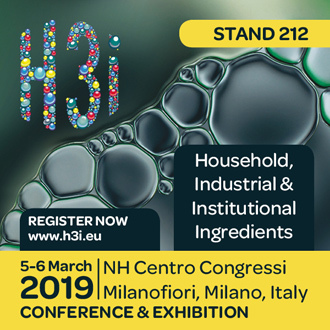 We look forward to welcoming you on March 5 - 6, 2019 at booth 212 at the largest european exhibition for the detergents, household and cosmetics industry. Discover more about CHT’s Consumer Care Solutions. We are pleased to present to you our innovative specialty silicones for extensive applications, from car care and cleaning agents up to cosmetics. HANSA CARE 8012, an innovative blend of various silicone components suitable for formulating high-quality paint sealants, car polishes or impregnations. With HANSA CARE 2255 for care care you can easily produce high-performance gloss dryers or shampoo formulations with an ideal wax and hydrophobic effect. BeauSil AMO 918, a sugar modified silicone, is ideal for the daily care of stressed hair.